Grevillea buxifolia, commonly known as Grey Spider Flower, flourishes in sunny, sheltered areas and in the dappled understorey of larger plants. 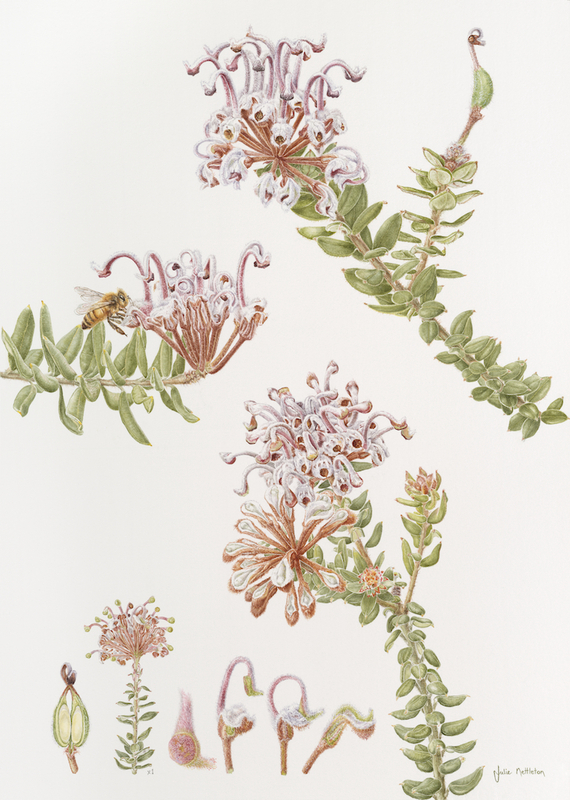 This painting was done from plants growing at North Head Sanctuary on Sydney Harbour in heathland known as Eastern Suburbs Banksia Scrub (ESBS). Here a rich diversity of native plants grow on ancient, nutrient poor aeolian sands. Grevillea buxifolia grows up to about 2.5 metres with a compact habit. At North Head it flowers for much of the year but in less sheltered coastal areas of NSW flowering season is shorter, from about August to November. One cluster of flowers is held at the end of each stem. Flowers have a delicate honey-like perfume and are host to an extremely busy traffic in bees.